Wichita’s gardens first opened to the public in 1987 as a 9.5-acre space that mostly served as a place for garden clubs to meet and serious gardeners to convene. Botanica Wichita has been blooming for 30 years and today offers visitors 30 themed gardens with walking paths, sculptures and water features on 17.5 acres near the Arkansas River in Wichita’s Riverside neighborhood. 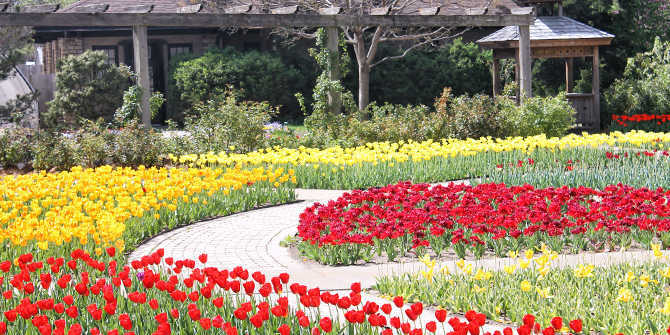 Botanica Wichita is not only one of the city’s top outdoor attractions for all ages, it is recognized as one of the best horticultural displays of flowering species in the country. Its compact layout allows 250,000 annual visitors to enjoy the entire garden in a few hours and still see something new during every visit. Botanica is incorporating a 30th anniversary celebration into most special events it has planned this year. Another new element this year is the addition of a fairy garden to the Woodlands. Visitors can walk through the garden to see what the fairies are doing, and they will change with each visit. The gardens are open year-round 9 a.m. to 5 p.m. Monday-Saturday. From April through October they also are open 1-5 p.m. on Sunday and from April through September they have extended evening hours until 8 p.m. on Tuesday and Thursday. March, April and May are the pinnacle of the spring season, with flowering trees, thousands of daffodils and 64,000 tulips blooming. In late spring the tulips are replaced with tens of thousands of flowering annuals. From June through September, the only butterfly house in the Midwest is occupied by tropical butterflies feeding on colorful flowers. During the fall months, hundreds of chrysanthemums line the walks until the first freeze. During the holiday months, 2 million lights transform the gardens into Illuminations, a spectacular light display that attracts 70,000. “Whether it is flowers, art, music, parties, butterflies, family time, education or relaxation, Botanica offers something for everyone,” said Marty Miller, Botanica’s executive director since 2008. Miller attributes the gardens’ growth over the past three decades to a small, dedicated staff collaborating with volunteers and donors to make the gardens a destination for all ages. Opening the $3 million, 1-acre Downing Children&apos;s Garden in 2011 made Botanica a hit with young families, although guests of all ages enjoy the imaginative and interactive elements, from a climbable 20-foot-tall monster tree head to a musical maze. One of Botanica Wichita’s newest additions is the Chinese Garden of Friendship that opened in 2015. It is structured after a scholar garden that would have existed 800 years ago in China, with representations of plants, water features, rocks, structures and art. This is the first sister cities garden representing the relationship between Wichita and Kaifeng, China, and Botanica Wichita hopes to add future gardens to honor Wichita’s sister cities in Mexico and France. The current major project underway is the Carousel Project scheduled to open by Spring 2018. The $4 million project involves restoring the 36 carousel horses of one of three remaining Allan Herschell carousels, which was operated at the defunct Joyland amusement park in Wichita and donated to Botanica in 2014. The restored carousel will be housed in a new building that will have room for parties and verandas to view activities in the garden. The landscape around the building will include a grand lawn with a performance stage large enough to hold concerts performed by the symphony. Be sure to stop by Garden Café for light snacks and specialty drinks. including coffee roasted by Wichita’s The Spice Merchant & Co. The café is right next to the indoor children’s library that offers weekly story time, games and a treehouse. Botanica Wichita offers weekly educational and entertaining programming for adults, children and families and holds special events – some activities are included with admission and some carry an extra fee. May 18: Mother’s Day – special activities and mom’s get in free! Check the gardens’ event calendar for more information and a full list of events.